Urban Tilth cultivates agriculture in west Contra Costa County to help our community build a more sustainable, healthy, and just food system. We hire and train residents to work with schools, community-based organizations, government agencies, businesses, and individuals to develop the capacity to produce 5% of our own food supply. Founded in 2005 to help build a more sustainable, healthy, and just local food system, Urban Tilth has emerged as a local leader, a catalyst drawing together a variety of individual, discrete initiatives into a web of integrated, food- and community-focused efforts. In sum, we farm, feed, forage, teach, train, build community, employ, and give back. We help our community grow our own food; train and employ our own young people as “home grown experts”; teach our local residents about the relationships among food, health, poverty, and justice; and forge partnerships with local small farmers to increase demand for their produce. 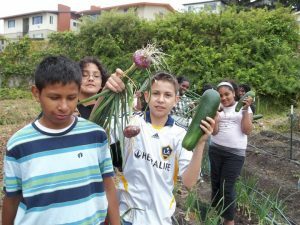 We use our 7 school and community gardens and small urban farms to teach and employ community members to grow, distribute, cook, and consume thousands of pounds of local produce each year, to create a more equitable and just food system within a healthier and more self-sufficient community.